Strongest independent mount hand guard system available. Unrivaled strength against trail debris. Vigorously tested for durability and quality assurance. Great alternative to wrap around systems for woods or MX. Patented folding shield for those unexpected quick departures. Trick billet aluminum mounts & reinforced backbone on shield. In-molded rubber edge provides increased protection. Under or over bars mounting for easy installation and clean hand control area. Complete Racer Pack Includes: Shields, Mounts & Hardware. All factory colors available with decals pre-applied. About an hour into my first hair scramble I had a nasty get off at moderate speed in a rocky area. The Cycra handguard completely folded around the clutch pinning it to the grip making the bike unridable. I was able to (after a few minutes thanks to being fatigued) bend it back in the right position and carry on. With that said, I do think it’s a decent handguard depending on the type of riding you do and the terrain you do it in. I just don’t trust it and will be swapping them out for a wrap around guard. Look nice, but not built for durability. They look nice and I think the idea of the guards has potential, but a few minor crashes and these things are toast because of poor design and materials that are not very durable. The plastic used to support the flags cracks when slammed against the edge of the aluminum mounts. The result is that the spring mechanism does not have enough material to stop the flags from just sitting against your lever (see photo). The clutch side lasted maybe 6 rides with only minor crashes and I can see that the brake side is also starting to crack. Not worth the price unless they update the design and materials. The plastic portion that is prone to crack needs reinforcement or to be made of metal. Plastic cracked/ripped where guard pivots and now just rests against the lever. Do your hands feel safe? 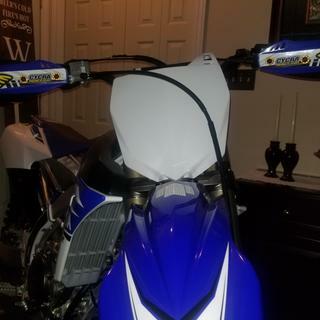 These are my 3rd pair of Cycra Rebound handgaurds for my 3 bikes at home, they truly are very easy to install in 10 minutes once you figure out your desired positioning of them. Look super good and definitely do their job in protection. Highly recommended. 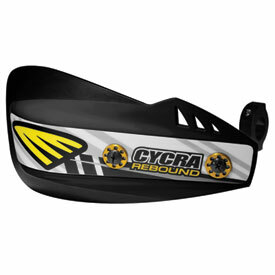 The Cycra Rebound hand guards are the best option I have found to replace my wrap arounds. They offer enough protection to keep you from smashing your knuckles. When hitting trees in the tight stuff they offer enough protection to deflect you away from the trees and such. They don't give you the same protection as full wrap around handguards. They can break when the bike falls over, they offer little protection for your clutch and front brake levers. On the other hand, you will never get your arm broken because you got it stuck in the wrap around while you flipped over the bars! Received today and installed in less than 10 minutes. Great handguards for a flag style. I really like the look of them on my '16 YZ450F. I got them in Yamaha Blue to match my scheme. I’ve used these last year and I’m using them this year and let me tell ya, there amazing for the price protects your hands and keeps that mud off would recommend! Exactly what I wanted without all of the bulk of a full wrap around. No major hits, so I cannot attest to its durability but it seems pretty solid so far. These Cycra hand guards are built to last , rigid enough to stand up small trees and branches. Saves your knuckles. American made ?? I would recommend these hand guards. They are built tough and easy to install. First day of Baja trip. One single tip over in the softest sand broke the reflex part of the handguard. At speed it would blow the guard back against the brake lever. Had to remove them. Total junk. They work well and look good, great product very durable highly recommend this for your bikes. Very pleased with the quality, durability, and performance. Highly recommend them. Happy with the purchase. Very pleased with the performance, quality, and durability. They were delivered exactly as was described. Recommended for everyone! Very reliable and easy to assemble. Very tough compared to other handguards. Definitely recommend. Love these. Wrecked pretty hard and didn’t bother them one bit. Product was easy to and appeared to be very sturdy. Had small low speed tip over in soft conditions and the tab to keep the rebound from hitting your levers broke. Waste of time, money and effort. If your looking for durability, go with full wrap around guards. If you looking for roost protection get a flexible guard at less than half the cost! Very disappointed and looked forward to these since I've like all other Cycra product I've purchased. Mounted these on my son’s 65. Guards looked great and had no issues with fitting them on his bars. His first wreck and the aluminum mount bent allowing the guard to rest on his break lever. Called Cycra to try and buy replacement arm and was informed replacement parts were not sold and I would have to buy a new set. After my experience with Cycra’s customer service and this product I will not buy any of their products. This is as good as a flag style hand guard will get. They bolt on easily and are pretty sturdy. Frontal impacts don’t phase them. The rebounding feature is nice because it saves the guards themselves. I use these with odi bar ends. It’s a good setup for off-road. I would recommend the rebound and girls really enjoy them and they look good recommended ! Love the rebound handgaurds would recommend !! moved kill switch and starter switch just a bit. mounted over controls, had three unplanned landings no damage at all. the narrow gap between two trees where i was unwilling to slow down is where they really paid off my throttle side just nicked the tree and the next second i was WOW glad i put these knuckle savers on. DID NOT FALL . These look awesome on the bike. Super easy install, looks and feels pretty sturdy, can't wait to test them out. Deflects stuff away from your hands. These are good if you don't like the full wrap around bark busters. They deflect roost and bushes pretty well. Nice that the fold forward to prevent them breaking off easily. I have a few rides with them and I haven't broken them yet. Easy installation, quality product and works as advertised. Couple of spills during the first race after installation and they flexed as designed and held up well. The original plastic rebound bar broke at the track on a tip over, fabricated steel rebound bars. Steel rebound bars vibrate more and vibrated off the shield mid xc race. What a great product by Cycra. 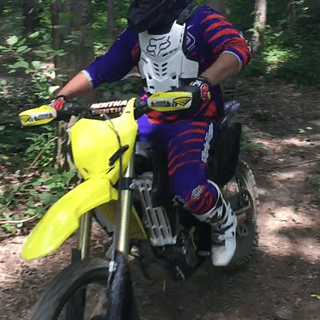 I have had these handguards on my bike for three months and have had no issues. Cycra did a great job with this design. Very sad on the performance of this Genuine American brands product. I merely took a little tip over and the entire hand shield snaps and broken beyond repair. Just as the last review. Tipped over, 1st gear barely moving in the sand!!! The bolt hole that holds plastic arm that attaches to the spring wallowed out so bad that the guard became useless. I took the guards off and retro-fitted them to an old set of Cycra aluminium mounts. Working great right now. The idea of folding guards is fantastic and it is about time! Cycra just needs to use a way higher quality composite plastic for the arms or go to aluminium. Love there products but this one is very low quality. 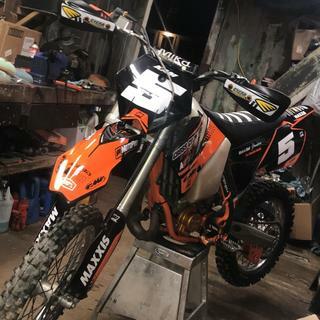 Used on a 2015 KTM 350SXF. Good product, easy to install. The shields piviot when your involved in a crash which is a great thing, but the plastic shield ripped from the mounting hole and the frame bent on the first slide out. Great video about the product where the guy breaks a stick while hitting them, but not sure if i believe it. I purchased this product after doing some research on reviews and from Cycra's website. They push the durability and the toughness of this product. If you go to their website and they have a video on the pride of the toughness and even beat it with a broom stick until it breaks. Cheesy almost like a infomercial. 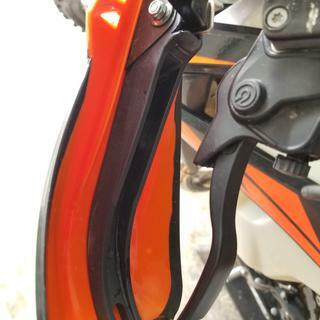 I have owned Cycra products in the past and had been very pleased with them but................. these handguards do not meet the previous quality of Cycra. I went out for the first practice session and the track being moist and slick I had a tip over in a corner. NOTE I said tip over nothing serious. Low speed in soft terrain and the hand guard snapped off. So much for the rebound! I had my stock KTM handguards on for a long time with tip overs and crashes before I damaged one. Again though these look nice and their website tells how tough these are they are weak and inferior to other products out there. BEST ANSWER: Yes. 1 1/8 bars are only that size where the bars mount in the clamps. Yes, I have a set on 1 1/8" bars now. They attach inside of your brake and clutch levers after the 1 1/8" bars taper down to the standard 7/8" size. Yes, they will fit as 1 1/8 bars are only the size of the main course of the bar not the ends where the grips and levers mount etc. I have oversized bars too and they fit just fine. Will these fit on 7/8" bars? BEST ANSWER: Yes they fit. I purchased a set for my Son's 2016 KTM. They fit perfectly and are of great quality! They should fit fine. I put mine on fatbars and had no issue.